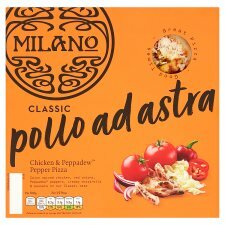 The are great with pizza and salad to create a perfect Milano night in. Keep refrigerated. If freezing, freeze on day of purchase and consume within 1 month. Once thawed do not re-freeze. Ensure pizza is piping hot before serving and serve immediately. These are guidelines only as all cooking appliances vary in performance. 1. The first step to pizza heaven is pipping hot oven. 3. Drizzle a little olive oil over you pizza to give it a crispier finish.